Suddenly, I have more tomatoes than I know what do to with. I knew this would happen, as I planted about 15 seedlings, but I haven’t had time to prepare. I’ve been wanting to buy or build a food dehydrator for some time, but simply haven’t had the time to do so yet. Someone recently suggested using the back of my car, since it gets lots of sun and gets hot on a sunny day. 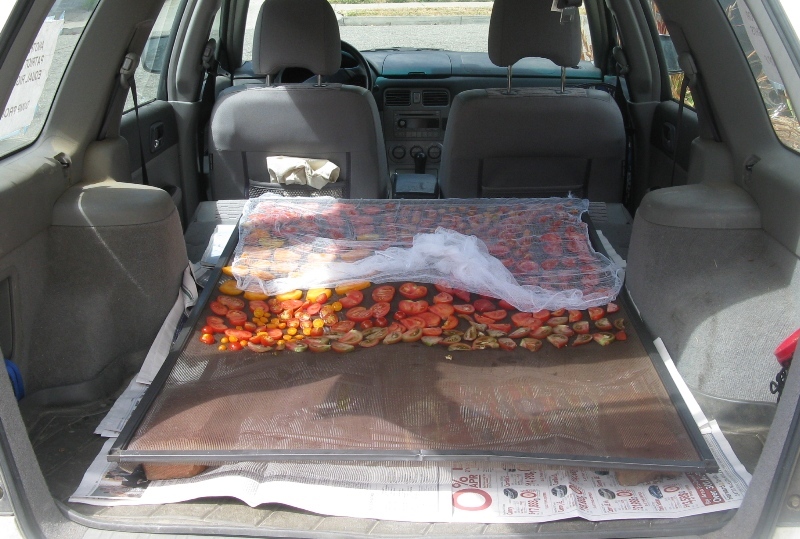 So, I washed an old window screen, elevated it on bricks over some newspapers and started laying out sliced tomatoes to dry. We’ll see how well it works. I think this is a great way to get sun-dried tomatoes for later use, if all goes according to plan. And it has lots of room for more tomatoes as they ripen! Love it! How did it work? We can’t grow tomatoes – too cold and not enough sun in our part of SF. I even tried suspending one plant (growing out of the bottom of a bucket) to try to raise it to a height where it might get a few minutes more sun than the rest of the yard (which gets shady quickly). Nothing. Sounds good! I’ll send you petri dishes of aphid poo and various lovely shades of moss and molds, and you send me bags of tomatoes!